The Dartmoor Railway is a 15 1⁄2-mile (24.9 km) long railway line in Devon, England. From Crediton the line parallels the Tarka Line to the site of the former Coleford Junction. Heading west, it then serves Sampford Courtenay, Okehampton and Meldon Quarry. The section from Crediton to Coleford Junction is owned by Network Rail and from there to Meldon is owned by Aggregate Industries. In the past freight trains served the ballast quarry at Meldon. The line is leased to and maintained by the Dartmoor Railway CIC, who operate some services and facilitate access to the line by other operators. Great Western Railway run a public service between Exeter and Okehampton on summer Sundays. Ballast and stone trains were formerly operated by one of the national freight operating companies. In 2011 the quarry was mothballed, leading to the suspension of ballast and stone trains. The line is also used occasionally by other operators for training purposes,and is visited from time to time by main line charter services via the connection to the national network at Crediton. The route was originally part of the London and South Western Railway's West of England Main Line (route from Exeter to Plymouth), which opened between 1865 and 1879. In 1968, British Rail closed the line beyond Meldon as part of the Beeching cuts. The Exeter to Okehampton passenger service was withdrawn by British Rail in 1972. Between 1972 and 1997 the line was used for railway ballast traffic from Meldon Quarry and occasional freight traffic to the remaining goods yard at Okehampton before its closure. Occasional charter and special trains were operated to Okehampton and Meldon Quarry during the passenger closure period. The railway reopened to regular passenger services in 1997 with the formation of Dartmoor Railway. 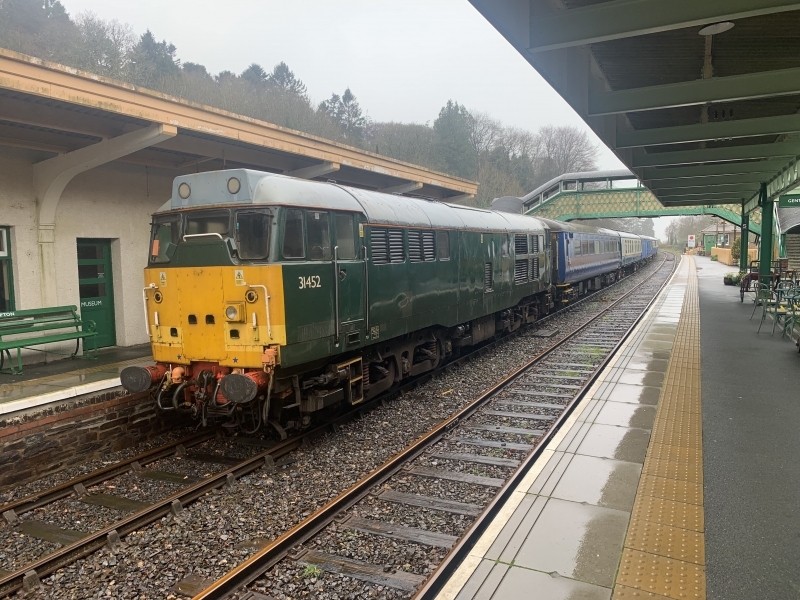 A summer Sunday passenger service was introduced from Exeter to Okehampton as part of the Dartmoor Rover network. British American Railway Services Ltd, a company created by Iowa Pacific Holdings of Chicago, became the new owner of the Dartmoor Railway CIC on 4 September 2008. The company announced its intention to develop freight, passenger and tourist services on the railway. Volunteer support for the railway is provided by the Dartmoor Railway Supporters Association (DRSA). Volunteers assist the railway operation in many of its activities. A proposal was made in 2009 to restore and reopen the disused down platform at Yeoford and extend Dartmoor Railway services to terminate there. At the time it was not possible to agree arrangements with Network Rail, who own Yeoford Station and the section of line from near the site of the former Coleford Junction towards Yeoford and Crediton. If this proposal were eventually achieved it could allow the extension of Dartmoor Railway passenger services and make interchange with Exeter - Barnstaple "Tarka line" trains possible. Please give us your overall rating for Dartmoor Railway.